Probably not known outside the UK, but a great comic actor with perfect timing. One of my aims when I opened my Etsy shop selling vintage graphics was to have as wide a variety of images available as possible. It took me a while before I realised this was tapping into something called the 'long tail'. The graph shows how this works. 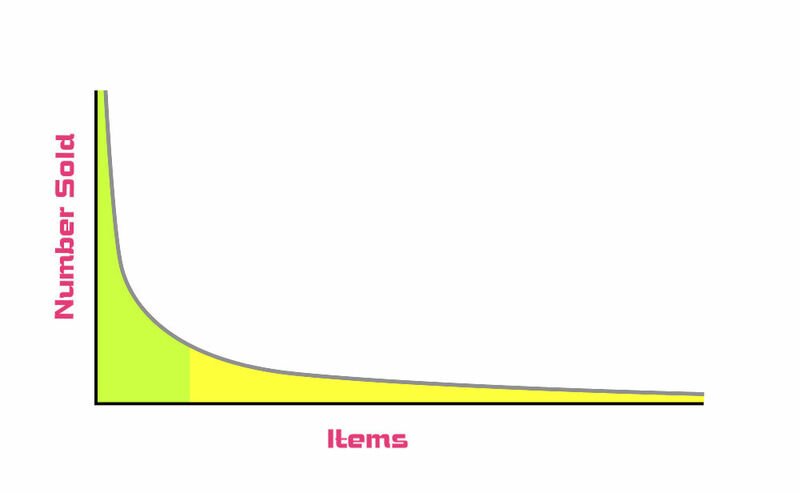 The area in yellow is the same as the area in green, but represents a large number of distinct items sold in relatively small quantities, rather than the small number of items sold in large quantities represented by the green area, which is where the best sellers like the Dan Brown books or '50 Shades' series are to be found. By aiming for wide variety, I am targeting this long tail. At first this was an accident, now it is a deliberate tactic. Note that this is not the same as catering for a 'niche' market. As a strategy, niche marketing is aimed at being a big fish in a small pond, concentrating all your efforts on a small but specific and well defined segment of the population. Catering to the long tail is the opposite. Because I print to order and therefore don't have to either anticipate what will sell or keep large stocks, I can spread my efforts very widely. As a comment on the Longtail blog linked at the end of this article put it "The market is a mile wide and an inch deep". I'm not alone in this of course, this is the Amazon model where over time products with a low sales volume collectively make up a market share that rivals or exceeds the relatively few current bestsellers and blockbusters, provided that distribution channel is large enough. This is why I wouldn't attempt this approach on an independent web site. Etsy as a brand already brings huge numbers of people to their site and I can tap into their searches to make my sales. This possibly also explains why original art doesn't sell so well on Etsy or similar sites. The market for 'things to hang on the wall' is huge. That part of it looking for original works of art is much smaller. Out of that smaller market the proportion who will like your style and subject will be even smaller even if they find you. In addition, since the search process relies on using words to find images, the search terms for original art are very much harder to pin down, especially for abstract art. There are visual search tools but they do not have the reach of Google text searches. In my case it is even more difficult because Etsy's failure to properly differentiate between reproductions and originals or even between a downloadable file and the physical image once printed, makes the search results whether on site or via Google, hopelessly contaminated. In an earlier post, I proposed an adaptation of the core-housing approach adopted in developing countries, with serviced plots on which would be constructed a basic unit of one living room, a kitchen and a bathroom. The plots would be big enough to allow extensions and additions to this core provision as the owners needs grew and changed, without the need to move and incur estate agents and legal fees. The original planning permission for the site would allow for the construction of a dwelling over no more than a fixed proportion of the plot area, without requiring anything other than Building Regulation approval. This would probably done by creating a Local Special Development Order setting out some basic parameters, such as maximum plot coverage and storey limits plus perhaps some rules about development at the boundaries. In this post I’m going to look at how this could work through the stories of six different households. …are newly married. They are currently living in a small flat with no outdoor space, a tiny shower room and minimal cooking facilities. They have very little savings. Both are currently working, Alfred is a mechanic while Grace is an administrator in a local doctor’s practice. They fully intend to have children, but don’t want to do so while in their present flat. …have been married for about 7 years, Their son, Harvey is about to start school and Gloria is looking to get back to work part time. They do not intend to have any more children. James works in IT management. Before Harvey was born, Gloria had been working in a local architectural practice as a CAD technician and graphic designer. They currently live in a 2 bed flat, rented from one of the partners in the architectural firm where Gloria worked. He is looking to sell and they need to move within the next 12 months. …is divorced, in his early 40s. He has no children. He is a plumber and general builder. He currently rents a flat and a separate lock up in which he keeps his tools and materials. He also plays in a band in the evenings and weekends and enjoys a full social life. …are in their 40s with two children, girls aged 12 and 14. They currently live in a standard 3 bed semi built about 15 years ago. As their children get older, they would like to provide them with space to do school work and to socialise with friends in ways that don’t disrupt the house for their parents. John is a butcher with his own shop, while Mary works part time as a teaching assistant. She would however very much like to get back to making pottery, having studied ceramics at university and worked for a while as a studio assistant to a well known artist. …are two students at the local university. For the purposes of this post, I’m assuming each plot has a road frontage and provided with all mains water, electricity and if available gas, plus phone line and broadband connection. Basic provision on the site will be the core unit of a single room plus a kitchen and a bathroom. Foundations will be adequate to take a two story building in traditional construction. All purchasers will be provided with a pack showing full details of all services plus technical details of foundations and a site survey at sufficient detail for setting out any further building work. Constructional details for a range of extensions will be available for purchase from the developers. First occupants will also have the option of a 'turnkey' deal for the construction of any extensions. The plots vary in size but all are large enough for a two story family house. With very limited money Alfred and Grace decide to live in just the basic unit but they buy the constructional details to add a bedroom when they are ready. The basic unit is about the same size as their present flat, but they will have the full plot available on which they intend to grow their own fruit and vegetables while they save. Next door, James and Gloria need to build additional space from the start. They extend sideways and build a new storey above both the basic unit and the extension. On the first floor they create two bedrooms and a bathroom. Downstairs they extend the kitchen into the former bathroom and open it up to the room adjacent. The extension becomes their new living room. George and Stephanie decide to keep their new house on one floor. They extend in both directions to create two new wings at right angles to the core. In one wing they create a large bedroom and a fully accessible wet room, with space and storage for equipment such as hoists to cater for Stephanie’s needs as her illness progresses. The new bedroom opens directly onto a small garden space with level access for a wheelchair. In the other wing they create two rooms. One is a guest bedroom with a shower. This will also be available for live in carers to use if need be. The other is a small office/studio space that Stephanie can use to take private students for language classes either individually or in small groups. It has its own door accessible from the street so that students can come and go without disrupting the rest of the house. David Lean decides not to extend for the moment but to build a two storey detached building with the aim of storing his tools and materials on site. He builds this on the boundary with a garage and store on the ground floor and an office and music room above, incorporating high levels of acoustic insulation across the whole building. Before buying he has checked that the planning permission for the development allows for the possibility of running businesses such as his. John and Mary extend in a similar fashion to George and Stephanie, in both directions, although they also build upwards. On one side of the core unit they build a wing with two bedrooms accessed off a third room across the front of both. This provides a shared living space for their two daughters and incorporates a bathroom and toilet. They allow for an independent entrance into this area, but do not construct it yet. On the other side they build a two storey extension. On the ground floor they create a ‘parent space’ with a bedroom and bathroom on the first floor. The core unit becomes a large kitchen-dining area. Alfred and Grace decide to construct the additional bedroom, using the pre-purchased plans, which will effectively double their living space. As the work is about to start, they discover that Grace is pregnant, so requiring a hasty revision. They subdivide the new bedroom to the rear by creating a small room to use as a nursery. They make sure water and drainage services are available to this extension since they are not sure what its long term use will be. Alfred and Grace decide to have another child. They have both had promotions and are financially more secure. Alfred is now workshop manager and Grace has become Practice Manager. Their daughter is also growing and needs more space. They decide to build a new wing on the other side of their living area with two bedrooms and a bathroom. The small room used by their daughter will become an en-suite bathroom and the core unit will become a single kitchen-dining area. James has become disenchanted with working for a large company and wants to set up on his own account. He decides to set up as an IT trainer. He only needs an office at home since most of his work will be on the clients premises. He builds a simple freestanding garden office. Gloria will work with him as a trainer from time to time, but she is looking to develop her own career. David decides he needs a larger living space. He is now engaged and with his new partner gets finance to build a new two storey extension. The ground floor will become a new kitchen dining area, with a bedroom and bathroom above. The old kitchen and bathroom will be stripped out and large new glass doors put in to give access to the garden, so that the whole of the original core unit becomes a living space. the Ford’s children have now left home. They could downsize, but Mary’s mother is becoming frail and needs support. She moves into the space that had been used by the two girls and they insert a tiny kitchen for her, as well as opening up a separate front door. Gloria Stewart and Mary Ford have decided to go into business together as a design consultancy. David has given up his business and now works for a local builder's merchants. He rents out his old office and store to Gloria and Mary, putting in an outside staircase to give him a separate access to his music room. Stephanie has died and George is finding the house too large for him. He decides not to move however but instead subdivides his house, selling the space that had been used by the carer in Stephanie's last years to David and his new wife living on the adjacent plot, to incorporate into their own house to give space for his expanding family. He retains his old kitchen dining area and bedroom/ bathroom, in the knowledge that as he grows older it will continue to be usable. After the death of Mary Ford's mother they let the small flat as a separate unit to Alice and Carol, a couple of students at the local university. Alice works part time for Gloria and Mary, while Carol provides care and domestic support for George and some other elderly residents in the area. George has now died while David and his wife have moved away. George’s children buy back the portion sold off to David and reinstate the original house which they then sell to Carol and Alice who are after graduation have now married. Alice is now a journalist and freelance writer while Carol is working as a physiotherapist, working from the space Stephanie had used for language classes. David’s old house is sold to Penny and Albert Marshall. They are a middle aged couple whose children have left home. They have no need for the music room so sell the whole building to Gloria and Mary whose design consultancy is growing and needs more space. I could continue in this vein, but my aim is not to tell family stories but to illustrate how designing for flexibility in use and the creation of a liberal enabling framework for small scale developments can generate both social and economic benefits. I’m not suggesting it is a model for everyone. Some people would rather move than build while others will need to relocate with new jobs. Nor is this about self build, although there is no reason why it could not be done that way. It might even be easier, with the site and core accommodation secure. If however we are to tackle the real crisis in housing in the UK and the exclusion of young people from secure access to housing, then we need a radical rethink. All too often a so-called starter homes is simply very small. The approach described here allows that initial tiny property to grow and adjust to changing family circumstances without the disruption and loss of community caused by having to move elsewhere. For the nth time, I'm going to try to restart this blog. I spent a while going back over some old posts and decided I don't want to let it go. I'm not going to change the name this time. The idea behind the title is still relevant and can be stretched to cover the other things I want to write about. I may add in art for sale, either my originals or the reproductions , but they won't be too prominent and may even be on a separate page.